vSphere Integrated Containers (VIC) leverages TLS (transport layer security) to ensure communication security between client and Virtual Container Hosts (VCH) providing not only traffic encryption but also guaranteeing the identity of the certificate and it’s creator. 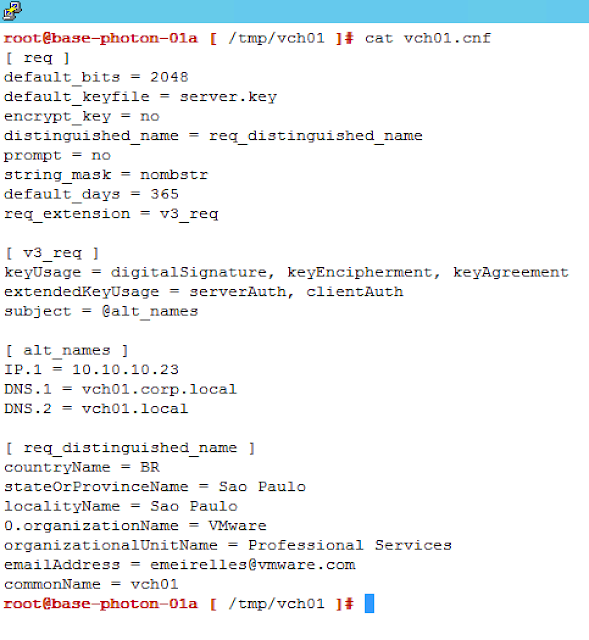 In a previous post I already talked about protecting your VCHs with TLS, but it lacks a process on how to generate your own Certificate Signing Request (CSR), which can be used to request a valid certificate from an internal or public Certificate Authority (CA), keep in mind it’s not intended to be a definitive guide, certificate is a wider subject with a lot of options that can be leveraged, like encryption methods, key size, certificate requirements, etc.. with that said, use at your own risk and make sure to test it before going into production. 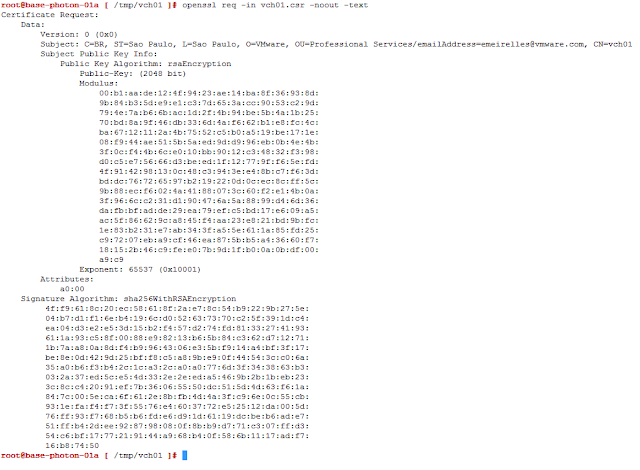 I will use Openssl tool to generate an RSA Private Key and CSR, if you don’t have it yet download and install it first, it has a version available for each of the popular O.S. 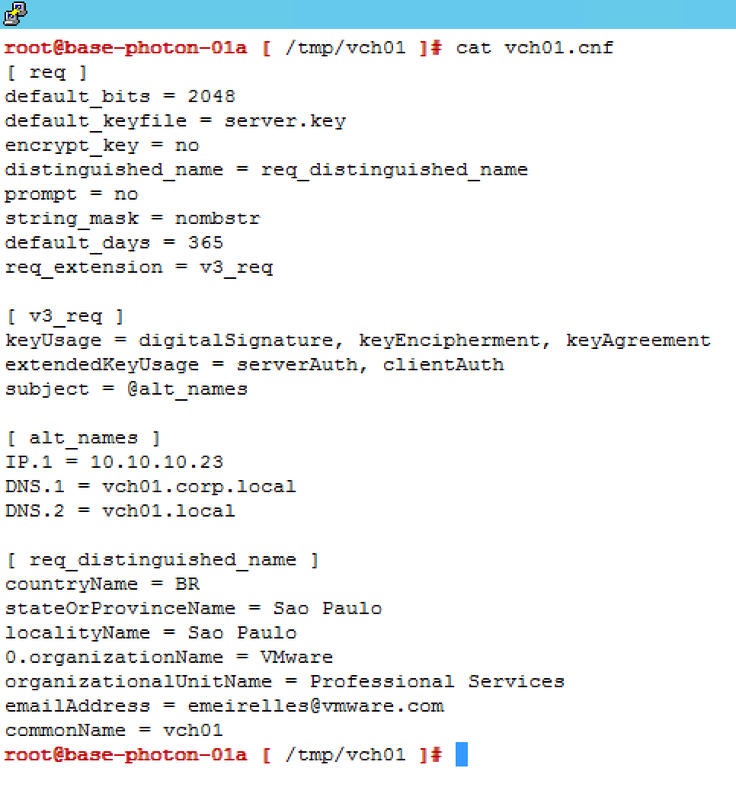 For the purpose of this example, my VCH will be named vch01, defining a name for your VCH is important for the certificate specifications like common name, make sure you adjust it accordingly when creating your owns. VIC does not support PCKS#1, so if you have a key like that convert it before proceed. Now that we have our private key we can generate the CSR. If everything is fine you can send it to your CA in order to generated a signed certificate. Once you get your signed certificate back is just a matter of creating your VCH with the certificate as I stated on Protecting your VCH post. At this point the process of generating your CSR is done, but if either you don’t plan on having your certificate signed by a CA or wish to test your new implementation while the CA is signing your certificate what you need then is to self sign your own certificate. Self-signed certificate can also be done with openssl, you only need a RSA key and a CSR, which we just created so we are good to go. That's it, you now have your self signed certificate to create your VCHs. It’s just because your key is encrypted, you need to remove the passphrase from the key, check the steps above on how to remove passphrases from your key. Hey Andy, I'm glad you manage your issue out.